There is decidedly way too little information about inflatable kayaks, either about the purchase or use of one. In this blog I will go through the process of equipment purchase, usage, comparison, as well as description of places to go for an incredible experience in an inflatable kayak. About 2-1/2 hours drive outside of the San Francisco Bay Area is this little hidden garden of Eden type of a gem, not far off Highway 5. Along the drive there, you see a lot of dry farm land and you wouldn't think there is this calm river with lush green banks. We kayaked this river briefly (for about an hour) in our inflatable kayak when we were on our way to Sacramento. That's the beauty of inflatable kayaks - you can put 2 tandem kayaks in the trunk of a car. And here is the exact location as described by the California Kayak Put-In Index. Beware that after you click on the "View Large Maps" link, make sure to look for the green arrow by zooming out and panning around. For some reason, Google Maps doesn't always start at the correct location, but the green arrow is the correct put-in location. From here, just do a page search for the location you need. Then click on the link. The resulting multi-day chart clearly shows high tide, low tide, the height, as well as sunrise and sunset. The chart format is just so much easier to read than text tables. It is simple and effective. 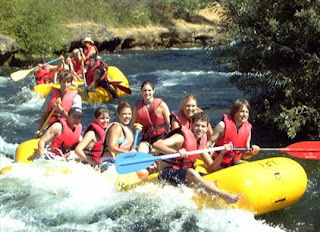 A good stretch of river for some easy kayaking is the section from Knights Ferry to Orange Blossom on Stanislaus River. It is all class 1 with a short class 2 section in the beginning call Russian Rapid. Many web sites have written about this part of the river so I won't repeat them. I do want to point out that the Stanislaus River water flow varies depending on the time of year, usually with higher flows in the spring and lower in the late summer. The river is controlled by a dam higher up so there is water till late in the season (fall). Paddling Tips: There is only one short rapid (Russian rapid) just below Knights Ferry. Inadvisable in an open boat above 500 cfs, all canoes get swamped above 800cfs. This is a blind rapid with a well-marked short portage trail river left. The trail can be paddled at 1100cfs. One of the best features of inflatable kayaks is that they collapse into a small package. Some are even small enough to fit into a suitcase to be brought onto an airplane thus suitable for traveling. 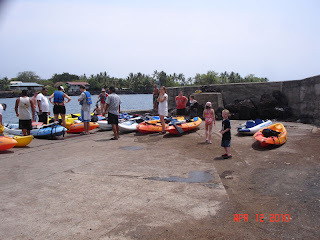 I did just that a few weeks ago - brought a tandem Pathfinder kayak to the Big Island of Hawaii. "Each bag must weigh 50 pounds or less and have a maximum dimension of 62 linear inches (length + height + width) to avoid additional charges. " My suitcase measured 30" x 20" x 12" which is exactly 62" total. The kayak, 2 paddles, 2 seats, 2 foot rests, 2 fins, the foot pump, and a few other miscellaneous stuff fit in it just fine. It cost $15 each way for a total of $30. Unfortunately, the weight of the suitcase exceeded 50 pounds by about 8 pounds. This caused some last minute mad scramble at the airport check-in counter to swap out the heavier things for some lighter stuff from another suitcase. The heavier things were the paddles. It was a good thing that we had another large luggage where the paddles fit. Here is a picture of the suitcase. It doesn't seem like it, but the suitcase is very large. The Big Island of Hawaii has no navigable rivers. Sure, you can kayak anywhere in the ocean, say launching from the beach. I had wanted to try some surf kayaking near a beach but there just didn't seem to be enough waves of the right size for that at the beaches we went to. I think Waikiki Beach would have been perfect since it supports outrigger canoe surfing, but Waikiki is not on the Big Island. All is not lost, however. 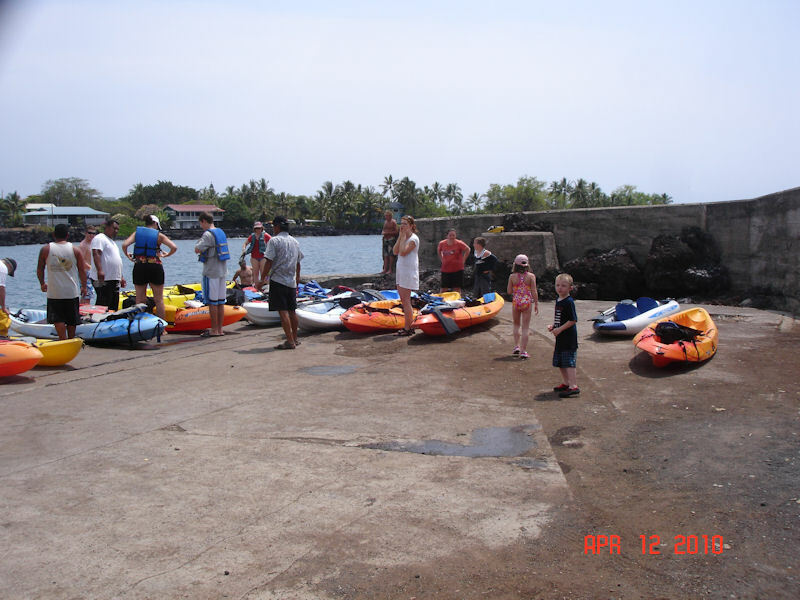 There is one can't-miss location to kayaking and it it worth it all by itself: Kealakekua Bay or otherwise known as Captain Cook's Monument. The white monument marks the spot where the English explorer Captain Cook was killed by the locals when he first discovered the Hawaiian islands. It's kind of a long story, but the short version is that the locals first thought the sailors were gods when they arrived on their big sailing ships. However, after a few days the natives got suspicious when they found that the sailors' poop smelled bad and decided that they were not gods. A fight took place and Captain Cook was killed. The clear water at the base of Captian Cook's monument in Kealakukua Bay offers some of the best snorkeling on the Hawaiian Islands. It just so happened that there is no real road to get to the water, so kayaking from the other end of the bay to the monument is preferred. For the four of us, we used the Pathfinder tandem and rented a hard shell tandem kayak for $60. There used to be a place right at the launch pier where you could rent kayaks. However, for one reason or another, the government closed it. Now, everyone must rent kayaks in town and drive the several miles to the launch pier. There is usually a person from the rental company at the pier to help lower the kayak into the water. The government also started to require permits to land near Captain Cook's Monument. We were able to fax in the request and the permits were emailed to us. Because we weren't sure which day we were going to the monument, we were faxed a permit for each day we were in Hawaii. A side note about the island life. We rented our kayak from a family owned business and picked it up the boat at the owner's house. He strapped the kayak on our rental car, took our $60, and said "have a good time." We didn't sign any papers and he didn't need a credit card deposit. It was all done by a handshake! If only we could be this trust worthy on the mainland. Here we were getting ready to go. I brought my 12 volt Airhead pump, so to pump up the kayak, all I had to do was pop the hood of the rental car, connect the leads to the battery and start pumping. Even the employees of the kayak rental companies were amazed at how easy it was. Well, they were more amazed at the fact that we first drove up with 4 people in the car and only one kayak on the roof. The paddle across the bay was extremely nice. The water was so smooth, it felt like you are pushing on silk. It was so blue the picture doesn't do it justice. The Pathfinder performed very nicely, as expected. The water was extremely calm that day but there were some rolling waves. I did notice that the side of the Pathfinder is rather low by design. If I hit a wave at the right angle, some water will splash into the boat. Hey, this is Hawaii, getting wet is not a problem! I did notice that I chose to use the one piece paddle provided by the kayak rental company. The paddles that came with the Pathfinder were terrible! There is a high degree of flex on the paddle surface, so when I pushed on the water, the paddle gives. I never was able to paddle with full strokes and I never got the satisfying feeling of kayaking that a completely solid paddle provides. It helped to have flexibility on which day to go to Captain Cook's. We picked a day that was very calm, as noted from our hotel room when we woke up. Other days were quite bit windier, although the kayak rental people always said that any day is a good day to go. Many kayakers have seen spinner dolphins jumping out of the water at Kealakekua Bay. We didn't see any. Here are some videos some unrelated kayakers took. I am so jealous! We landed at a small cove to the left of the monument, as recommended by the rental company. The surf was a little bit rough. The hard shell kayak landed easily on some shallow rocks. Because I didn't want to scratch or tear my inflatable, I had to look for a steeper drop off. It took a few minutes, but the Pathfinder landed OK as well. It helped that I had someone else to help spot and pull the kayak onto the rocks. The sea life here is just amazing. I've been snorkeling in other Hawaiian islands, but the Big Island is the closest to the unspoiled Hawaii of them all. On other parts of the Big Island, we swam with turtles and saw huge manta rays at night. On the other hand, on another trip, we went snorkeling at the well know snorkeling site Hanauma Bay on Oahu and saw just a handful of fish. Here at Captain Cook's, you don't have to go looking for them. They are everywhere. Check out this picture of the yellow tangs seen from the shore where we landed. Because we arrived at the launch pier in the afternoon, we didn't have as much time as we wanted to spend at the monument. We has a quick picnic lunch at Captain Cook's and did some snorkeling. Before long, we noticed that the last of the other kayaks were starting to leave. Not wanting to the the only boat there, we packed up and left, too. Part of the reason we got a late start was that the Big Island is really big. It took over an hour of driving to get from our hotel to the kayak rental place. Once we rented the kayak, we had to drive it down to the pier, about 30 minutes total. Set up took another 45 minutes as we had to wait for a large number of returning kayaks to be hauled up. Paddling across the bay is another 20 minutes. Suffice to say, if you want to spend a lot of time at the monument, start early! Here's a picture of my daughter and I in the Pathfinder with Captain Cook's Monument in the background. All in all, we learned a great deal bringing the Pathfinder to Hawaii. We saved $30 overall since we only had to rent one kayak instead of two. Would I do it again? I think if we kayaked one more time on the trip, it would have definitely worth the hassle of lugging an extra suitcase around. Why didn't we kayak another time? That's another story - a week in paradise is not quite long enough.